The three are at the historical library looking for information on Jeremy. They find out that Grace and her husband were killed in a fire that townspeople believe Jeremy started. Crane is convinced that Jeremy inherited some of Katrina’s powers. The paperwork also says that Jeremy was put into a home shortly after his “parents” died. The librarian is less than helpful, and Henry believes she is hiding something. Before they can question her, she has rushed off to her car, only to be attacked and killed by the mummy creature. Abbie obtains all of the librarian’s work effects, and included is a weird box with Katrina’s coven’s symbol on it. Inside is a book that contains a drawing of Jeremy’s toy. Henry is able to recall the images of a priest at the home beating Jeremy. Jeremy bled on his doll, which caused it to come to life and attack and kill the priest. Crane believes this beast followed him back from purgatory, and is going after the coven members that hurt Jeremy by banishing his mother from the coven. Crane is reminded of a bible passage, and they determine that this monster is a Golem, a protector created by an oppressed individual. The librarian also went cross-country, visiting carnivals to see a group called “The Four Who Speak as One”. These are original members of Katrina’s coven that banished her. Crane believes that they can help him release Katrina from purgatory, but they must get to them before the Golem does. Meanwhile, Frank has picked up his daughter for the weekend and is spending time with her at the park. A street vendor goes glassy-eyed and starts talking to Frank in a weird way. Frank attacks the man, but whatever was inside him goes into another woman. So now it looks like there is a traveling demon that is going from person to person to torment Frank. Crane, Abbie, and Henry go to the carnival to confront the witches. Crane tells Abbie he must go on his own. He finds the witches, and they definitely look at least 250 years old. They say it is their fate to die on that evening, and they will do nothing to help Crane or Katrina. They couldn’t stop Jeremy, so they imprisoned his Golem in purgatory and hexed Jeremy to stop his heart. They tell Crane that only his son’s blood can stop the Golem. The Golem attacks the carnival, and the witches are killed. The Golem shatters a mirror, and a shard of glass cuts Crane. Henry tells Crane that his blood is his son’s blood. Crane talks to the Golem, telling it that Jeremy is gone now, and there is no one left to protect. The Golem appears to calm down, but tries to attack Crane, and Crane stabs him with the bloody glass. The Golem is dying, and Crane takes his hand. He is speaking to it as though it were his son, telling him he has endured enough pain, and to bear it no more. Crane appreciates the protection that the Golem gave his son, but needed the senseless violence to end. The Golem dies, and turns back into the little doll that Katrina had given Jeremy. Back at the police station, Abbie goes to get some food, leaving Crane alone in her office. A mirror cracks and a different world appears within it. Crane is suddenly in the woods, and is confronted by Moloch. Moloch tells him that a saint named Assan will appear, and this will cause the end of days. 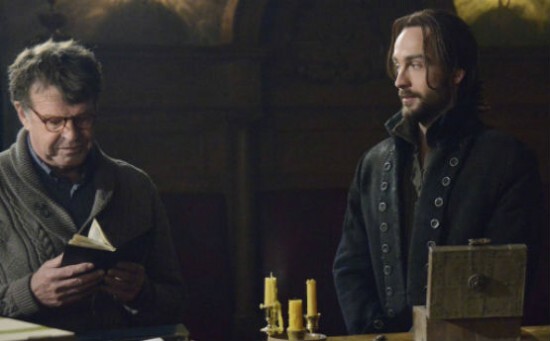 He also tells Crane that he will end up with Abbie’s soul, and Crane is the one who will give it to him. Crane reappears on the floor of Abbie’s office, where he tells her that Moloch wants her soul, and he will be the one to deliver it.